Madden NFL 18 is an American football sports video game based on the National Football League and published by EA Sports for the PlayStation 4 and Xbox One. 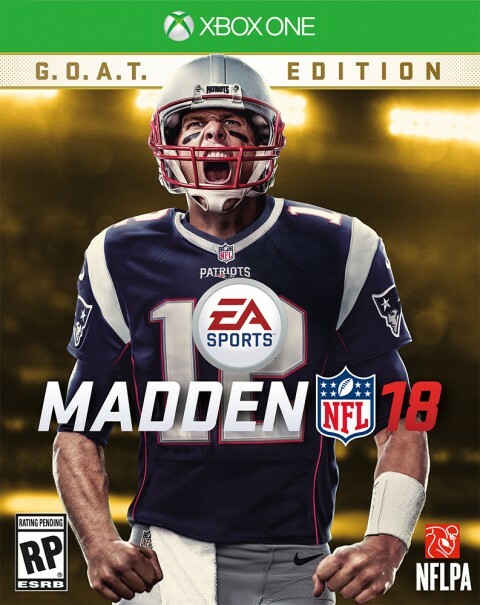 The 29th installment of the Madden NFL series, the game features New England Patriotsquarterback Tom Brady on the cover, the second straight year a Patriots player has the distinction, following tight end Rob Gronkowski. The game will be released on August 25, 2017, although those who pre-ordered the “G.O.A.T. Edition” were able to play it three days earlier. It will be the first game of the series since Madden NFL 2005 to not be released on both the PlayStation 3 and Xbox 360, and also the first game in the main series to be available on only two platforms since Madden NFL ’94. Madden NFL 18 will introduce a story mode known as Longshot, which follows Devin Wade, a quarterback from Mathis, Texas, as he tries to reach the NFL, and will include high school games and college games, as well as the NFL Scouting Combine. It will be the first game in the series to use the Frostbite engine.